Looks like the moon is waxing gibbous tonight. "As the nights go by you can see changes in the moon. After the moon is full you see less and less of it. There are three or four nights with no moon at all. Then you see more and more of it. The moon seems to change." Currently reading The Moon Seems to Change by Franklyn M. Branley, author of almost 150 engaging science books for kids. Branley was also the co-founder of the Let’s-Read-and-Find-Out Science Book series, books that made scientific concepts accessible to young children. He was Astronomer Emeritus and former Chairman of the American Museum of Natural History-Hayden Planetarium. Husband and wife Ed and Barbara Emberley collaborated on the illustrations in The Moon Seems To Change. Branley gives a simple and understandable explanation of how the phases of the moon work, but I would say that it is best read alongside a grown-up who might be able to clarify information when needed. 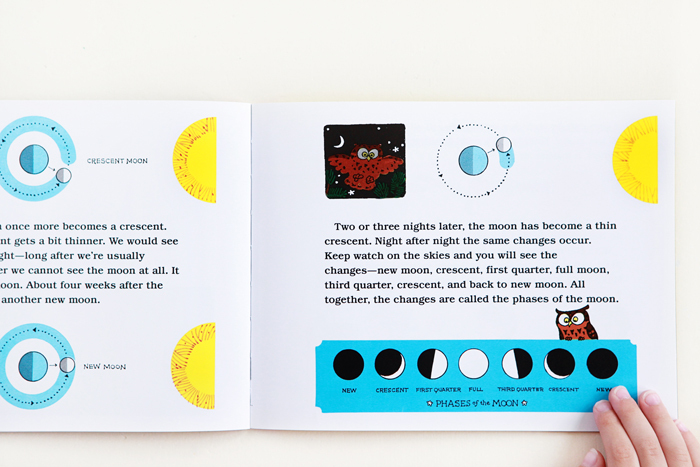 Branley includes instructions about how kids can conduct their own experiment that shows the phases of the moon using a flashlight, an orange, a pencil, a marker and a friend.